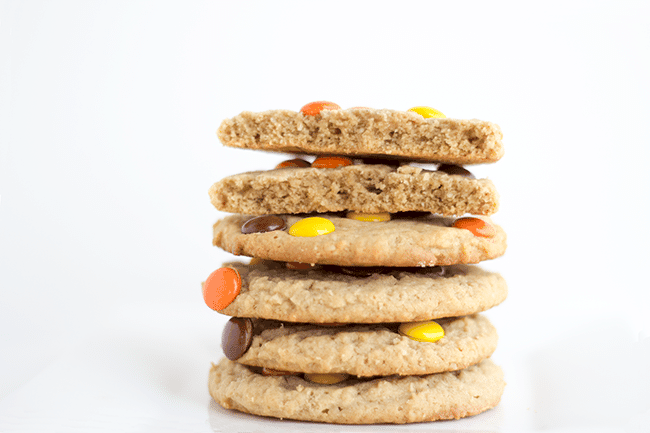 Who is back on a peanut butter kick? ME! Yes, once again I’m uncontrollably consuming large amounts of peanut butter. It’s like my go-to treat and mostly, by the spoon full. I think it’s hereditary because my mom just informed me last night she’s been eating peanut butter on crackers, with spoons, and by the jars. That last bit was a little fib. She’s trying hard to be healthy and lose weight as am I. If you’re wondering how I’m going to manage to lose weight while I make all these wonderful baked goods, I don’t really know. I would say with moderation, but that’s a lie. I’m horrible with moderation. 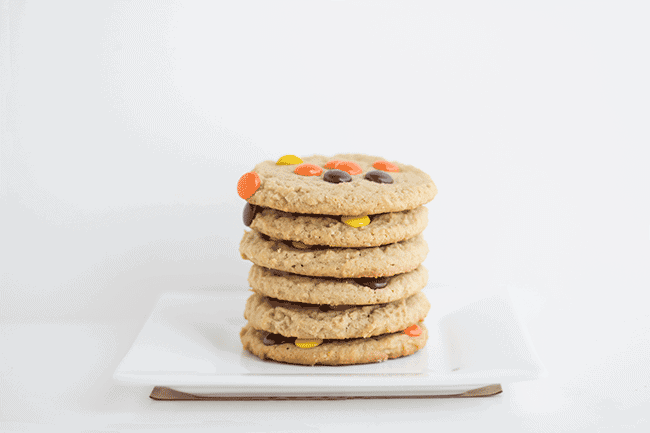 These chewy, peanut buttery guys are irresistible. They’re slightly crumbly from the oatmeal that we turned into a flour and incredibly soft. 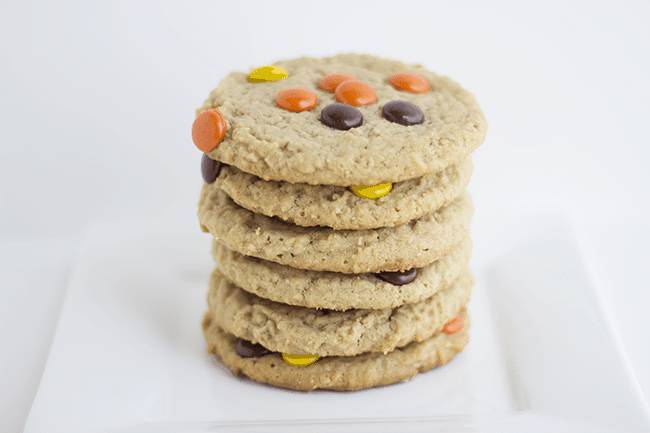 Let’s be honest, most everyone loves a soft and chewy cookie. So yeah, try these and indulge, like I did! I only placed my Reese’s pieces on the tops of my cookies. I wanted to be able to see them more or less, but you can feel free to throw them into the dough. 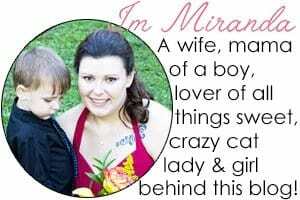 I just like to go for pretty especially for the blog. If I was in a hurry and was making them for family, I would just toss the pieces in the dough and give it a stir. It’s up to you and what you feel like doing. In a food processor or mini chopper, add in the cup of quick cooking oats. Process until the oats have formed a flour. I didn't sift mine since I didn't mind if the bigger pieces of oats were in my cookies. Feel free to sift the flour to make sure you get all the bits of oats that didn't get processed well enough. In a large mixing bowl, add butter, shortening, and peanut butter. Mix on medium until creamed. Scrape down the sides. Add in the brown sugar and mix on medium until light and fluffy. Add in the vanilla and egg. Mix on medium until the egg is well incorporated. Scrape down the sides. Add in the oatmeal flour, all-purpose flour, baking soda, and baking powder. Mix on low until the flour is almost completely incorporated. Turn the mixer on medium and continue beating until the cookie dough comes together. Refrigerate for at least 1 hour. Just before the hour is up, preheat the oven to 350 degrees. Using a cookie scoop, scoop the cookies onto a baking sheet, Parchment paper isn't necessary, but feel free to use it. I would only place 6 cookies on the baking sheet so they have room to spread. 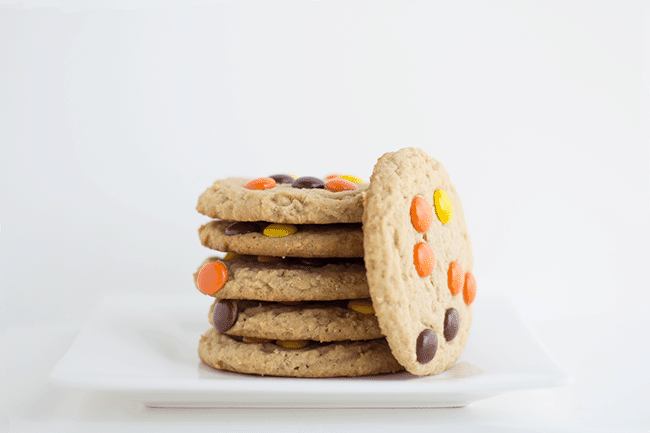 Place 5-6 Reese's Pieces on the tops of the cookies. Press them in slightly. Place in the oven for about 10 minutes or until the edges start to brown. Let them sit for about 10 minutes before moving them to a cooling rack. 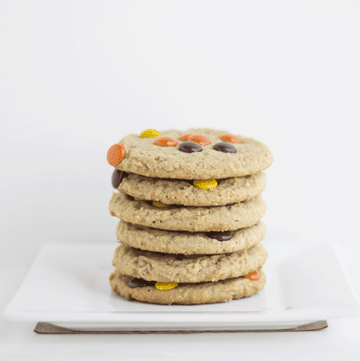 Oh wow more peanut butter recipes to drool over 😀 I love the idea of turning the oats into a flour I bet it added another tasty element to these cookies. I struggle as well with moderation, especially as the house is always full of baked goods, I try to give away as much as possible these days to friends and neighbours just to get the stuff out of my house!